The temporary replacement artists for John Buscema now continue with his younger brother Sal, who will last to #72. Then Frank Giacoia pinch hits in #73, before John returns from #74. We learned that Vision absorbs solar energy through his forehead jewel in #61. The molecular rearranger explains how the adamantium was turned into Ultron-6's body in #66, and how he could alter his body last issue. (Or indeed how he can move at all.) We weren't given any explanation when Black Panther disappeared between #65 and #66. This issue shows him in Wakanda repelling invaders. A flashback in Jungle Action #7 will refer to this as the trouble on Panther Island. As far as I know we never learn more than that. The small scene with BP includes the first appearance of Taku, who will become a regular in T'Challa's cast. The type of vibranium found in Wakanda absorbs vibrations (and their energy). It is one of the components of Captain America's shield. There is a different vibranium found in the Antarctic Savage Land, which emits a vibration which destroys metal. At the beginning of this issue Wasp is presumably wearing the same costume as last issue and the end of #66, and they are all probably supposed to be the same as the costume on all 3 covers, which seems to be the currently standard one introduced by Don Heck in #45. But whatever the truth of that, she dons a completely different one to attend the UN later. Ultron is of course not totally destroyed. You can't keep a good villain down. He will next appear in the Avengers #127/Fantastic Four #150 crossover where we will learn that Maximus of the Inhumans retrieves his head from the site of the explosion and revives him as Ultron-7 with a totally different body. Goliath, Thor, Wasp, Yellowjacket and a SHIELD team are closing in on Ultron-6 as he pulls the switch to blow up New York with a nuclear explosion. But the explosion doesn't happen, and Ultron beats a strategic retreat. Vision appears, and explains that, even though weakened by blasts from Ultron and SHIELD last issue, he had become intangible and infiltrated Ultron's machinery. There he had materialised and wrecked it. He hopes this makes up somewhat for the fact that he had rebuilt Ultron in #66 out of indestructible adamantium, under his preprogrammed commands. The android collapses and the Avengers take him back to the mansion, and feed him energy through the jewel in his forhead. Vision still doesn't revive, but Yellowjacket uses a mind-probe to extract an image from his brain, the image of the molecular rearranger. In #66 we learnt that this is the only thing that can affect adamantium. The Avengers contact the inventor of adamantium Dr MacLain on the SHIELD helicarrier. But he tells them that the molecular arranger is gone, and they guess that Ultron has it within his body. Yellowjacket contacts Black Panther, whose men are fighting off invaders in Wakanda, and asks for some vibranium. 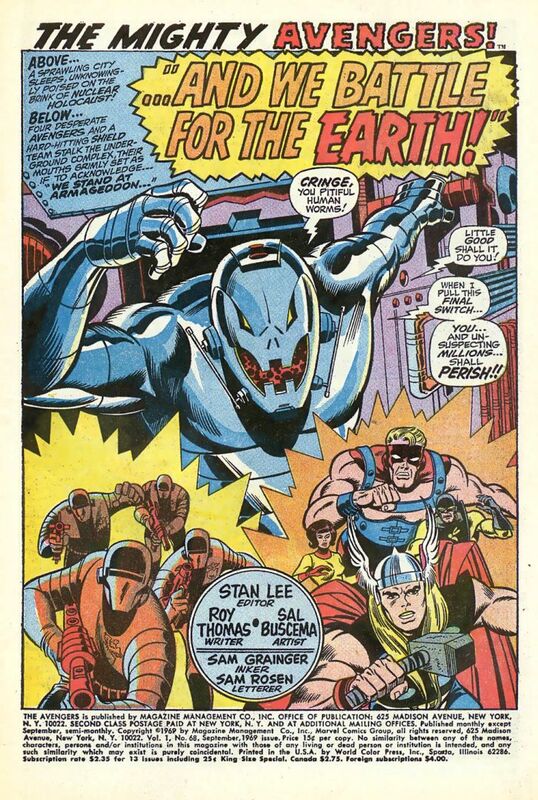 The Avengers lay a trap for Ultron by sending MacLain to the UN. Ultron senses it is a trap, but still wants MacLain who is the only one who can make more adamantium so Ultron can have an army of indestructible robots. Ultron attacks as Ultimate Ultron. Ultron-6 was embedded in a flying platform. This version walks. 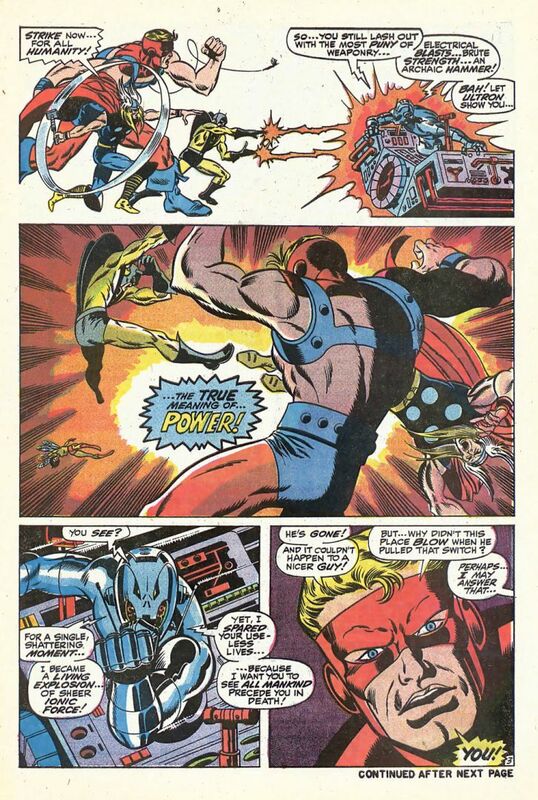 Goliath, Thor and Wasp defend MacLain, but Ultron captures him and tries to extract the secret of adamantium from his mind. 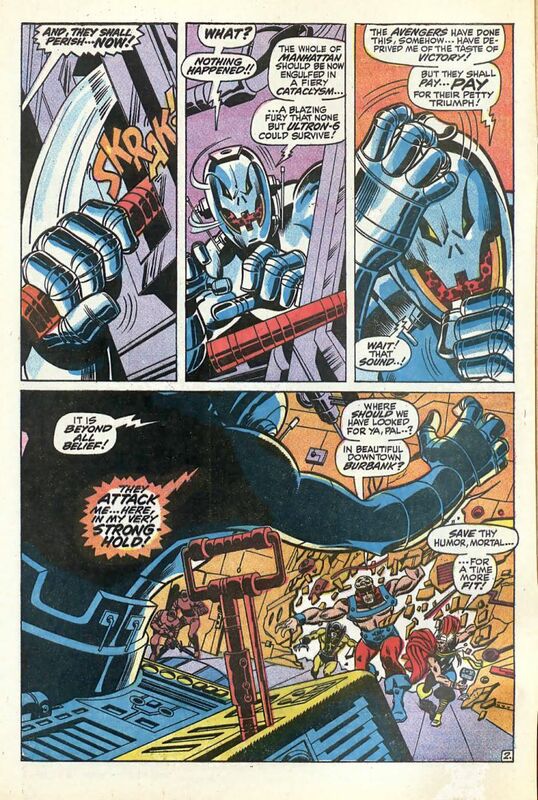 Something disrupts Ultron and seems to be destroying him. He swears to take New York with him, and prepares to turn himself into a nuclear explosion. But Thor covers him with a vibranium dome, which contains the blast. Dr Maclain turns out to be Hank Pym in disguise, and he had infected Ultron's brain with the thought 'Thou shalt not kill'.